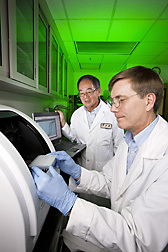 At ARS’s Western Regional Research Center in Albany, California, chemists Wallace Yokoyama (left) and Glenn Bartley use real-time PCR to analyze the activity of lab animal genes that may affect cholesterol level. No doubt about it. America loves blueberries. We each eat about three times more fresh blueberries today than we did 10 years ago. Blueberries pack a lot of nutritional punch: They’re low in calories and rich in vitamin C.
Studies by Agricultural Research Service scientists are expanding our science-based knowledge of this plump little fruit. The research, conducted primarily with laboratory animals or cell cultures, may provide a useful foundation for follow-up studies with humans. Such clinical trials are essential in order to determine whether responses to blueberry compounds observed in lab animals or cells also occur in people. ARS chemist Wallace H. Yokoyama, for example, is studying gene-based mechanisms that may explain cholesterol-lowering effects seen in laboratory animals. He is with the agency’s Western Regional Research Center in Albany, California. Yokoyama, along with former postdoctoral research associate Hyunsook Kim at Albany and chemist Agnes M. Rimando, at Oxford, Mississippi, collaborated in a recent study using laboratory hamsters. “Hamsters make a good model for our research because they, like us, can develop high cholesterol from eating high-fat foods,” says Yokoyama. All the hamsters were fed high-fat rations. For some of the animals, the rations were supplemented with one of three different kinds of blueberry juice byproducts: blueberry skins (peels) left over after the berries were pressed for juice and then freeze-dried for the experiment; fiber extracted from the peels; or natural compounds known as “polyphenols,” also extracted from the peels. Blueberry polyphenols give the fruit its purple, blue, and red coloration. At the Arkansas Children’s Nutrition Center, Little Rock, Arkansas, left to right, postdoctoral research associate Jie Kang, investigator Xianli Wu, and research assistant Yudong Tong use HPLC-MS to analyze blueberry compounds and the biomarkers related to atheroprotective effects of blueberries. In an article published in a 2010 issue of the Journal of Agricultural and Food Chemistry, the scientists reported that all the hamsters that were fed blueberry-enhanced rations had from 22 to 27 percent lower total plasma cholesterol than hamsters whose feed wasn’t spiked with blueberry juice byproducts. Levels of VLDL (very low density lipoprotein)—a form of “bad” cholesterol—were about 44 percent lower in the blueberry-fed hamsters. Why the interest in liver genes? Not all pieces of the cholesterol puzzle are in place. The researchers don’t yet know which berry compound or compounds activated the liver genes, or which parts of the berry have the highest levels of these compounds. Yokoyama’s ongoing research may answer those and other questions. 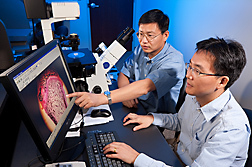 At Little Rock, Arkansas, investigators Jin-Ran Chen (left) and Xianli Wu use a fluorescent microscope to view inside a rat bone in studies to evaluate the effects of blueberries on bone function. High cholesterol can increase risk of cardiovascular disease—America’s number-one killer. At the Arkansas Children’s Nutrition Center (ACNC) in Little Rock, Xianli Wu is determining whether compounds in blueberries are involved in reducing risk of atherosclerosis. Wu is a principal investigator at the center, head of its Analytical Laboratory, and a research assistant professor with the University of Arkansas for Medical Sciences—also in Little Rock. Atherosclerosis is sometimes described as “hardening of the arteries.” It can set the stage for two leading forms of cardiovascular disease—heart attack and stroke. Atherosclerosis is characterized by unhealthy deposits of fats (lipids) inside blood vessels. These deposits form lesions known as “plaques” and can increase risk of cardiovascular disease. Wu has chosen, as his research model, laboratory mice that are predisposed to developing these atherosclerotic plaques. Medical researchers worldwide regard the plaques developed in this mouse model as similar to those that can form in human arteries. In a 2010 issue of the Journal of Nutrition, Wu and coinvestigators suggest that, based on their studies in mice, blueberries may play a role in reducing the formation of atherosclerotic plaques. “Our study provides the first evidence of its kind that blueberries can help prevent atherosclerotic plaques from increasing in size in arteries of laboratory animals,” says Wu. Specifically, Wu’s team compared the size, or area, of plaques in 30 of the mice. Half of the animals were fed rations that included freeze-dried whole blueberries in the form of a powder. Rations for the other mice didn’t contain the berry powder. The researchers measured the size of plaques in the aorta, the large artery that—in mice and humans—extends from the heart to other, smaller arteries, transporting oxygen-rich blood. Plaque area, measured at two aortal sites, was 39 and 58 percent less in the blueberry-fed mice than in those not fed the blueberry powder. Now, Wu’s group wants to uncover the mechanisms that played a role in control of plaque size in the research animals. His team’s real-time polymerase chain reaction tests and other assays suggest that antioxidant enzymes may be involved. The results showed that levels of genes associated with four of these enzymes, and the activity of the enzymes themselves, increased in the blueberry-fed mice. Wu collaborated in the investigation with Little Rock colleagues, including Thomas M. Badger, ACNC director and professor at the University of Arkansas for Medical Sciences, and Shanmugam Nagarajan, a principal investigator at ACNC and associate professor at the university. 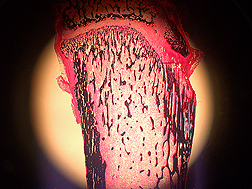 Cross-section of leg bone from a control-fed rat as viewed with fluorescent microscopy. 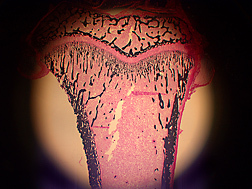 The black-stained areas are newly formed bone, and the pink and white areas are bone marrow. Can Blueberries Fight Breast Cancer? Mom’s nutrition and its effects on baby are also of interest to colleague Rosalia C. M. Simmen, a senior investigator who leads ACNC’s Breast Development Laboratory and who is also a professor at the university. Her studies of mammary gland development in laboratory rats may help medical researchers who are studying breast cancer, a leading cause of cancer-related deaths in women. Simmen and coinvestigators determined that several indicators of rat mammary gland health were improved in the offspring (pups) of mothers (dams) that had been fed 5-percent blueberry powder in their rations during pregnancy and during the weeks that they nursed their pups. The powder comprised 5 percent of the total weight of the feed. Simmen’s team evaluated several structural indicators of normal mammary gland development, including branching of the gland. There was significantly more branching in the offspring of the 5-percent group than in offspring of dams fed rations containing 2.5-percent or 10-percent blueberry powder. Cross-section of leg bone from a blueberry-fed rat as viewed with fluorescent microscopy. The black-stained areas are newly formed bone, and the pink and white areas are bone marrow. The team also analyzed several biochemical indicators and found, for instance, that the level of a tumor-suppressing protein, PTEN (which stands for “phosphatase and tensin homolog deleted in chromosome 10”) was significantly higher in mammary tissues of offspring of dams on the 5-percent regimen. That’s a plus, because PTEN is thought to help protect against cancer. In contrast, decreases in PTEN “are associated with development of many kinds of cancers in humans,” Simmen explains. 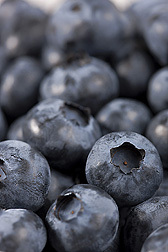 Lab animal studies of blueberries’ potential role in preventing breast cancer date back to 2006. But Simmen’s investigation, published in Nutrition Research in 2009, provides the first evidence, from a lab animal study, of the early influence that the mother’s blueberry consumption can have on normal, healthy development of the mammary gland in her offspring. Simmen collaborated in the research with Xianli Wu; Ronald L. Prior, formerly a chemist and principal investigator with the center; and Ph.D. student Omar Rahal. 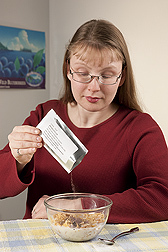 Agricultural engineer Rebecca Milczarek prepares for a taste test of blueberry placebo powder that looks, tastes, and smells the same as freeze-dried blueberry powder. The placebo was developed for use as a standard in human nutrition studies. If you were asked, “What foods build strong bones?” blueberries might not be the first food that comes to mind. But color-imparting polyphenols might turn out to have a powerful effect on formation of strong, healthy bones. This idea is being explored by Jin-Ran Chen, M.D., and his ACNC colleagues. Chen is a principal investigator and lead scientist in the Skeletal Development Laboratory at the center and is an assistant professor at the university. He specializes in research on how what we eat, during infancy, childhood, and early adulthood affects growth and development of our bones and our risk of developing osteoporosis or other degenerative bone diseases in later years. A weakening of bone that can lead to painful deformities, osteoporosis affects an estimated 10 million Americans. Another 34 million are at risk of developing the disease. Chen’s recent studies with young, rapidly growing laboratory rats suggest that blueberries might aid in building strong bones. The work has paved the way for new studies that might reveal whether blueberries could, in the future, be used in treatments to boost development of peak bone mass and to help prevent osteoporosis. Published in the Journal of Bone and Mineral Research in 2010, the investigation showed that animals fed rations that contained 10 percent freeze-dried blueberry powder had significantly more bone mass than their counterparts whose rations were blueberry free. Exploring further, the researchers exposed laboratory cultures of bone-forming cells (osteoblasts) to blood (serum) from the animals. Serum from the blueberry-fed rats was associated with an increase in development of osteoblasts into mature, functional bone cells. Serum in the blueberry-fed rats was high in phenolic acids, derived from blueberry polyphenols. The research suggests that the phenolic acids are responsible for the bone-building effects documented by the scientists. Chen’s team has also found a potential mechanism of action, or sequence of steps, by which blueberry-derived phenolic acids stimulate bone building in the rats. Their tests suggest that the pathway involves, for example, two genes, TCF and LEF, and a protein, beta-catenin. Beta-catenin is responsible for prompting osteoblasts to become mature and functional. TCF, or T-cell factor, and LEF, or lymphoid-enhancer binding factor, are responsible for promoting synthesis of beta-catenin. 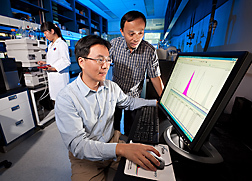 Chen’s collaborators in the study included Badger and Wu; and ACNC principal investigators and university faculty members Martin J. J. Ronis and Kartik Shankar. The idea that blueberries may help to reduce our risk of disease, in ways yet unproven, continues to intrigue nutrition researchers across the country and around the world. As this array of lab-animal and cell-culture studies demonstrates, ARS scientists are no exception. Researchers, and blueberry’s many fans everywhere, await the outcome of follow-up studies—with volunteers—that will clearly define the blueberry’s role in improving our health.—By Marcia Wood, Agricultural Research Service Information Staff. This research supports the USDA priority of improving children’s nutrition and health and is part of Human Nutrition (#107) and Quality and Utilization of Agricultural Products (#306), two ARS national programs described at www.nps.ars.usda.gov. To reach scientists mentioned in this article, contact Marcia Wood, USDA-ARS Information Staff, 5601 Sunnyside Ave., Beltsville, MD 20705-5129; (301) 504-1662. 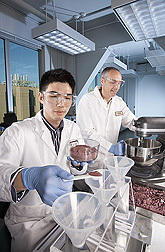 Student intern Bumjeun Kim (left) and food technologist Don Olson prepare the blueberry placebo for packaging. Let’s say you volunteer for a study of blueberries and your health. You and your fellow volunteers might be handed little packets of a sweet-tasting, purple-blue powder to sprinkle on your breakfast cereal. You’ll know, at the start of the study, that the powder some of you will be given is made of fresh, whole blueberries that have been freeze-dried. Other packets, for the rest of you, will have an imitation—a look-alike powder that serves as a placebo. Thanks to Agricultural Research Service scientists in Albany, California, there’s a new placebo that is the first to capture the look, taste, texture, and aroma of real blueberry powder. The placebo is the work of Tara H. McHugh, a food technologist and research leader of the ARS Processed Foods Research Unit, and colleague Donald A. Olson, a support scientist in McHugh’s team. Both are with the ARS Western Regional Research Center in Albany. A few years ago, the Folsom, California-based U.S. Highbush Blueberry Council, which administers marketing and research programs for growers and importers of blueberries, sought McHugh’s help in developing a new placebo that would match the Council’s own freeze-dried blueberry powder. “Now we can offer the placebo to scientists who are using our blueberry powder in research that we fund,” says Leslie Wada, a registered dietitian and research administrator for the Blueberry Council. Blueberry powder on vanilla yogurt. 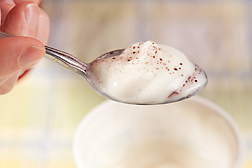 For some scientific investigations, a powder may be a better choice than fresh, whole berries. “Using a powder can help eliminate some of the natural variation that can occur in fresh berries from one harvest to the next as well as from region to region,” says Wada. “Though such variation may be minor, the uniformity of a standard powder may provide a more consistent, scientifically sound basis of comparison among results from different research institutions. The placebo is already being used in studies with elderly volunteers to determine the effects of blueberries in counteracting age-associated changes in brain function.—By Marcia Wood, Agricultural Research Service Information Staff. "Blueberries and Your Health: Scientists Study Nutrition Secrets of Popular Fruit" was published in the May/June 2011 issue of Agricultural Research magazine.